The ASUS PRIME X399-A is ready for AMD's latest Ryzen socketTR4 Threadripper processors, giving you the perfect foundation for an incredibly fast PC. ASUS Prime X399-A is the EATX motherboard that's been expertly engineered for professional content creators and power users who work hard by day and play harder by night. This powerful, innovative board puts a friendly face on advanced enthusiast controls, enabling you to maximise performance, cooling and personalisation with ease. So, if you live to create, explore, and to push the boundaries, look no further than the Prime X399-A. The Prime X399-A Cooling Kit contains an SOC heatsink and a fan bracket, designed to cool vital motherboard power delivery areas to enhance the overclocking potential of 2nd Gen Threadripper Series Processors. 5-Way Optimisation - One-click overclock and cooling, done! One click takes care of all that complex tuning. ASUS 5-Way Optimisation makes your PC smart. It dynamically optimises essential aspects of the system, providing overclocking and cooling profiles that are tailored for your rig. An automated tuning utility that optimises overclocking and cooling profiles for your unique system configuration. Fans stay whisper-quiet for everyday computing, and deliver optimal airflow when the system is crunching through CPU or GPU-intensive tasks. All-new stress test that allows users to optimise and overclock for CPU or memory-centric workloads. 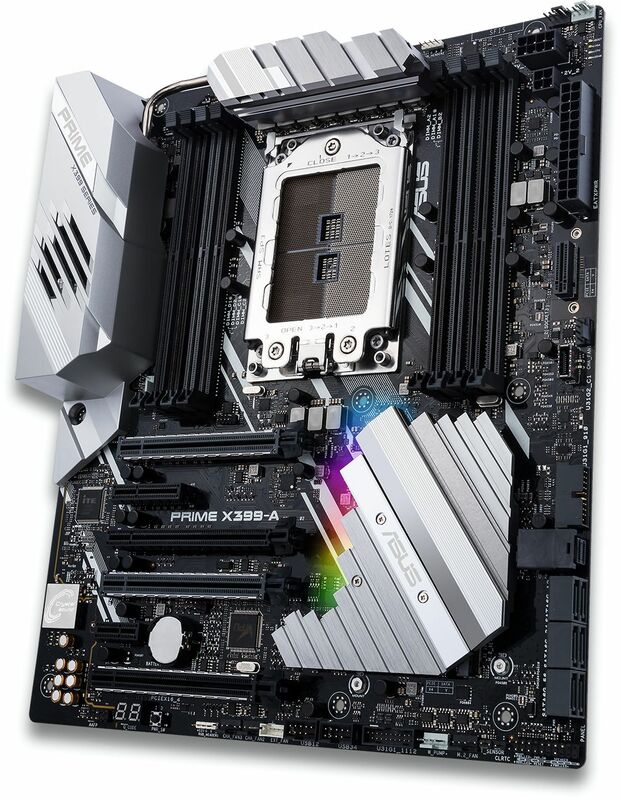 Prime X399-A features the most comprehensive cooling controls ever, configurable via Fan Xpert 4 or the UEFI BIOS. Each header can be set to monitor and react to three thermal sensors, and via Fan Xpert 4 you can even assign a sensor to monitor the temperature of supported ASUS graphics cards, for optimal cooling during GPU or CPU-intensive workloads. 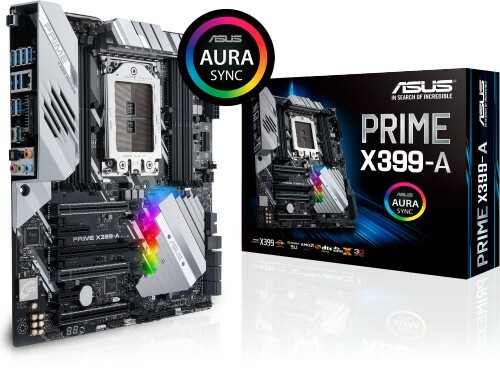 Prime X399-A is engineered to support quad-channel memory kits rated up to a staggering DDR4 3600MHz, allowing you to get the best performance from the X399 platform. ASUS have worked with all major DDR4 memory vendors to help ensure compatibility, so you're assured the best compatibility. A dedicated base-clock generator that extends CPU and memory overclocking margins. This custom solution works in tandem with the TPU to enhance voltage and base-clock overclocking control, providing the flexibility to extract every ounce of performance from Ryzen Threadripper processors. With x4 PCI Express 3.0/2.0 bandwidth, M.2 supports up to 32Gbps data-transfer speeds. It is the perfect choice for an operating system or application drive, providing fast access to data. Prime X399-A has an ultra-efficient heatsink to reduce M.2 SSD temperatures by up to 20°C — and that means optimal storage performance and improved SSD longevity. The revolutionary specification that lets your SSDs scream at top speed. Just attach your chosen drive to with plug-and-play ease to experience data-transfer speeds of up to 32Gbps — and free up a PCIe slot for another expansion card. With support for both NVIDIA SLI and AMD CrossFireX 2/3-WAY configurations, Prime X399-A motherboard enables multi-GPU setups so you can harness the full power of the latest graphics technologies to drive games at 4K and beyond. Prime X399-A utilises a unique audio codec designed in close collaboration with Realtek — the Realtek S1220A. It also features an unprecedented 120dB signal-to-noise ratio for the stereo line-out and a 113dB SNR for the line-in, providing pristine audio quality. Additionally, a new impedance-sensing circuit automatically adjusts gain to ensure the optimal volume range for your headphones.